Hi. My name is James Brennen. I will be the narrator for the remainder of this CD. On the last track, we discussed the various types of supervisees that are resistant to improvement: the yeahbut supervisee; the silent supervisee; the "I'll try" supervisee; and the irrelevant supervisee. Also, we presented various techniques for overcoming difficult conversations with these types of supervisees. On this track, first we will discuss Four Ethical Cornerstone Questions to Consider. This will be followed by a discussion of three key ethical considerations involved in the supervision of the therapist. The three ethical issues are proper knowledge and skill; avoiding dual relationships; and fair and balanced assessment evaluations. 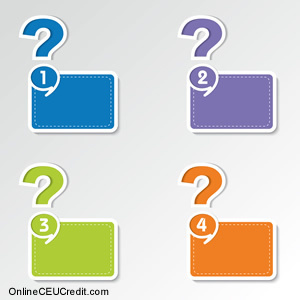 First, we will present Four Ethical Cornerstone Questions for you to consider. This technique is meant to help you evaluate a certain situation, your reaction to this situation, and the ethical implications involved. You might bear the following in mind the next time you yourself are faced with an ethical dilemma during the course of supervising. I'm sure you've heard these ethical cornerstones before in ethics courses, but I felt it appropriate to review them in light of your role as a supervisor. Question # 1: Is it right? This question is based on the theory of ethics that there are certain universally accepted guiding principles of right and wrong. In the case of supervision, would you consider it ever ethical to conceal a supervisee's weakness in your annual evaluation? Question # 2: Is it fair? This question is based on the theory of justice implying that certain actions are just and other actions are unjust. "Is it fair to disqualify a supervisee who is doing an excellent job but due to the death of his wife lacked three days of fulfilling the state requirement?" Question # 3: Who gets hurt? This question is rooted in the idea of attempting to do the greatest good for the greatest number of people. Some might say, "Many families will be hurt if I recommend this bigoted supervisee for a position at this inner-city family therapy institute." Question # 4: What does your instinct say? Although it may sound cliché, following your gut feeling can help you through many a sticky ethical situation. Regarding the supervisee mentioned above whose wife died your gut may tell you to bend the rule or somehow work out and alternate arrangement. On the other hand, your gut may tell you hiring the bigoted employee for the inner-city position is unethical. Now that we have outlined the Four Ethical Cornerstone Questions, let's look at three key ethical considerations. The first main ethical consideration is possessing proper knowledge and skill. This issue, though it may seem unnecessary to point out, may have drastic ramifications if ignored. As you know, the doctrine of "vicarious liability" can hold the supervisor at fault should a supervisee make an erroneous judgment and the client chooses to take legal action. -- 1. Providing information for supervisees to obtain proper informed consent. -- 2. Identifying errors made by supervisees. -- 3. Overseeing supervisees' efforts to develop and implement thorough treatment and intervention plans. -- 4. Knowing when supervisees' clients need to be reassigned, transferred, or have their treatment terminated. -- 5. Knowing when supervisees should arrange for consultation. -- 6. Monitoring supervisees' competence and addressing any issues concerning incompetence, impairment, and unethical behavior. -- 7. Monitoring proper boundaries between supervisees and their clients. -- 8. Reviewing and critiquing supervisees' case records and paperwork. -- 9. Providing supervisees with regularly scheduled supervision. -- 10. Documenting supervision provided. -- 11. Maintaining proper boundaries in relationships with supervisees. -- 12. Providing supervisees with timely and informative performance evaluations and feedback. The second ethical issue between supervisors and supervisees is avoiding dual relationships. Although sexual relationships between supervisor and supervisee go without saying, have you considered how even a friendship between yourself and your supervisee might affect such issues as objectivity and quality of evaluations? Also, I believe it's important to avoid misusing authority or manipulating a supervisee into an action that only reflects your own beliefs. Consider the case of Michael, a therapist in private practice provided clinical supervision to another, less experienced therapist Carmen. Carmen was employed at a community mental health. Michael was actively involved in his church, which opposed reproductive rights. During one supervision session, Carmen brought up a case involving a pregnant adolescent who was trying to decide whether to terminate the pregnancy. Michael talked at length about "the immorality of abortion" and according to Carmen, pressured her to share these views with her client. Carmen also stated, "My supervisor also talked me into attending services at his church. I didn't really want to go, but I felt like I had to. After all, I can't afford to get on my supervisor's bad side." As you can see, the supervisor in this scenario misused his authority to project his personal beliefs onto his supervisee. In addition to possessing proper knowledge, skill and avoiding dual relationships, the third ethical issue is creating fair and balanced evaluations. This requires keeping personal opinion about the supervisee out of the equation when assessing his or her skills. In addition to repressing possible personal negative feelings, it is also essential that an over-inflated opinion of the supervisee does not leak into the evaluations, to parallel your positive feelings of the supervisee. For instance, consider this case. Robert, a therapist in private practice, agreed to provide supervision to Nick, who recently received his degree. Nick was employed at a small family services agency as the sole therapist in the agency's family reunification program. Robert found his supervisee to be pleasant and receptive. However, Robert became concerned about Nick's clinical skills, especially those related to assessment and relationship building. Several months later, Nick applied for a higher-level clinical position at the family services agency and asked Robert to write a reference letter commenting on his clinical skills. Robert wrote the evaluation, but exaggerated Nick's strengths and glossed over his weaknesses. The promotion was granted, but before long, it became clear that Nick was not qualified to handle his new responsibilities. He was demoted and eventually left the agency. As you can see, the supervisor in this case acted unethically, due to his positive feelings about his supervisee and would actually have benefited the supervisee had he been more honest about the supervisee's capabilities. Of course the question begs to be asked why he didn't mentor his supervisee in the skills he was lacking to better prepare him for advancement. One can only guess that too much of a peer relationship had developed for this form of criticism to take place. On this track, we discussed three main ethical issues involved in the supervision of a therapist: proper knowledge and skill; avoiding dual relationships; and fair and balanced assessment evaluations. On the next track, we will examine methods to help improve your supervisee's therapist-client relationships.